I'm not sure if this was part of a bid to end Same-Same Cookering (TM Miss T), or an effort to combine a number of comfort foods in to one, but recently we've been toying with the idea that a tortilla is quite similar in many ways to roti. 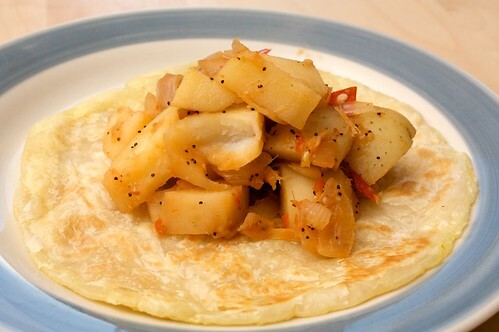 So we decided to try eating food on tortillas as if we were eating dahl and roti. This was a pretty genius idea. 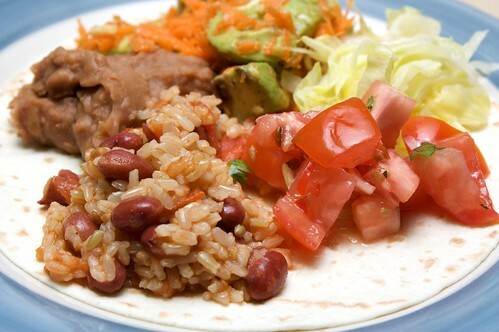 The rice was a brown rice with red beans concoction, and I served it with some refried beans (warm, heated from a can *cough*). As little cool sides I added 'avocado carrot with garlic salad' and 'fresh mexican chile sauce,' both from A Taste of Mexico, an awesome vegetarian Mexican cookbook. The chile sauce was nicely spicy, and I got to use coriander from our balcony garden! The combination of grated carrot with avocado was also very nice. Also added some shredded iceberg lettuce, because we had some rolling around the fridge. This was really simple, and really delicious! I love beans and rice. For Tuesday's brunch, I made a whole lot of cupcakes. On Friday I'd picked up some strawberries and blackberries from the markets, unable to decide which sort of cupcakes I wanted to bake. So I baked both, halving the batter in order to make six of each. It was awesome! 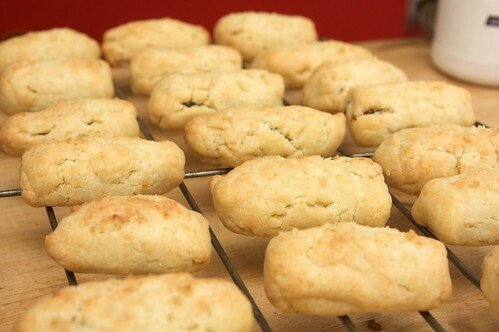 Also they were gluten-free, and still light and fluffy (for the most part). Hooray! The soy flour is a new addition to my gf baking, and it worked a treat! Thanks to Johanna for the tip! 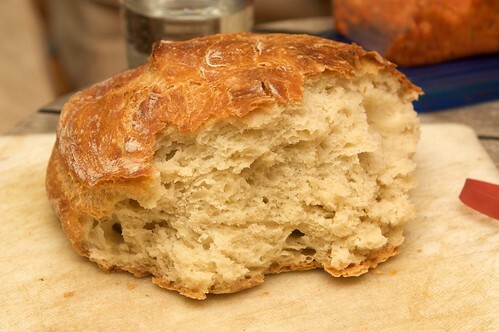 Combine flours, sugar and baking powder together. Add in essence, nuttelex and applesauce, then gradually add soy milk, whilst stirring. As soon as thoroughly combined, half the mixture into two separate bowls. Into one bowl, carefully mix the blackberries. Squish one blackberry carefully, in order to get some black berry juice in the mixture. 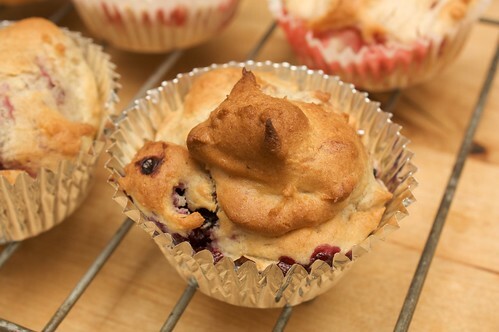 Be careful not to break any other blackberries, as this will change the colour and flavour of the batter. Into the other bowl, mix in the strawberries. Squish a strawberry in order to get some strawberry juice in there. Spoon in to a twelve cupcake tray. Bake for 20 minutes at about 180C. We've had some terrible to excellent experiences in pizza since we went vegan, but I will be honest - all of those experiences were at home, rather than at a store. I think that our recent pizzas of awesome are a testament to that. We just hadn't had a fantastical, amazing pizza from a pizza shop. That changed on Saturday, when we ventured over to Plush Pizza with Jo. It was amazing. AMAZING. 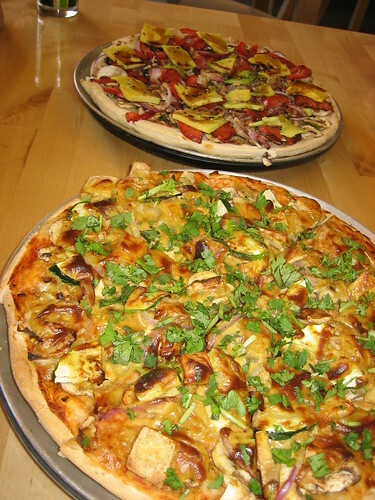 Featured here is the Satay Pizza (because penguins love pizza) and, at Jo's insistence, the Ben's Special. Not featured is the garlic pizza I ordered in lieu of garlic bread. 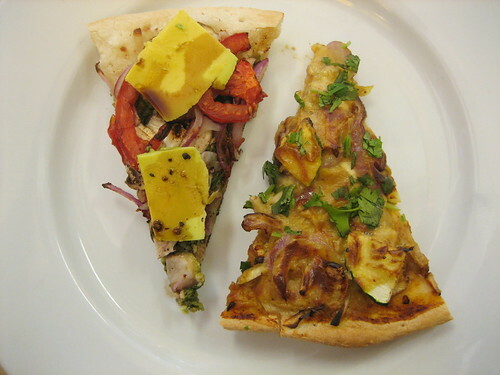 The satay pizza featured fried tofu, red onion, mushrooms, and roast zucchini with a satay sauce. It was fantastic. I would have eaten it all by myself, not sharing it, if I could have. I really want to eat it again. A lot. The Ben's Special was surprisingly tasty. It had balsamic vinegar, which is an instant face pull for me, I find it an unpleasant addition to just about anything. So it was to my surprise that rather than being defeated by a pizza featuring balsamic vinegar, I found it blended really well with the avocado, tomato, mushrooms and mozzarella. The prices at Plush Pizza are a little on the expensive side, but it is definitely worth it for an amazing vegan pizza. And the venue is cosy but friendly, with comfy seating and some nice looking mirrors. 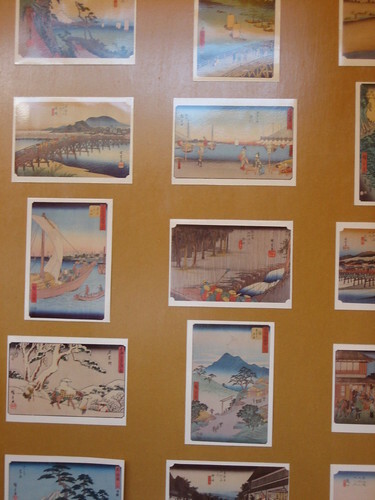 And postcards. And it comes recommended by others! You know what I love? Noodles. What a surprise! I hear you exclaim. I can tackle a bowl of noodles from a metre away, and I'm not ashamed of it. My ultimate comfort food is any sort of soupy noodles. It is unfortunate, then, that Danni is not a big fan of soupy noodles. Last week, after suffering a very large amount of the blahs, I really wanted noodle soup, and so we negotiated: lots of wontons for Danni, lots of noodles for me. 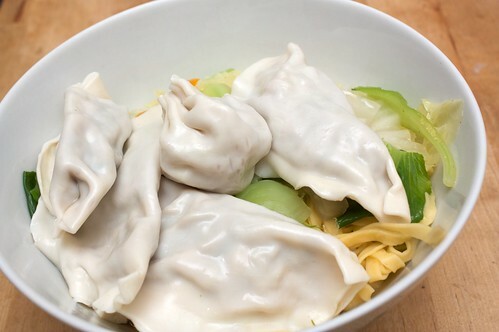 I've made jiaozi before, and I'll confess, my wonton making is remarkably similar to my jiaozi making, except I use different wrappers. Wontons are pretty straight forward to make. I like to either steam them or boil them, and serve them in a bowl filled with vegetables, noodles and soup. I promise that picture above has soup in it. It is just covered by a lot of noodles. Evenly dice the cabbage and mushrooms. In a wok, fry the mushrooms and cabbage with the garlic, in a small amount of peanut oil. After the cabbage starts to soften, add the chives, tofu, and soy. Smush and stir until it is well mixed and evenly coloured, for about three or four minutes. You may want to season with pepper, but this is not my thing. Put this aside to cool. The wrappers need to be defrosted, but preferably fresh from the fridge. This makes them easier to handle. Please also note that the wrappers do dry out quickly, so don't leave them out for too long. Some people recommend working with the waiting wrappers covered, but I can never be bothered dealing with that. Separate from the top, one by one. 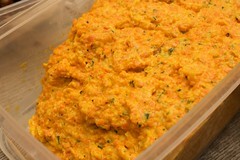 Place a small amount of cooled filling in the centre (about half to three quarters of a teaspoon). Moisten finger with water, and run around the edge of the wrapper. Fold up at the middle. 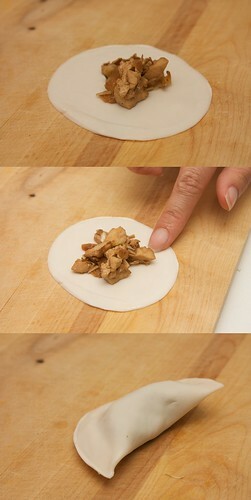 Pinch in at the sides (not pictured), so that instead of being a semi-circle the wonton looks more like a trapezium. I like to bring a big pot of stock to boil. My preference is for a soup with a full body, so dried vege stock won't be quite enough. I've got some celery pieces in the freezer, so into a pot (with vege stock in it) I'll throw one of those, plus to top of a carrot or two. This pot simmers away whilst I'm folding the wontons, then I scoop out the celery and carrot so it's just liquid. Into the pot, by this point boiling, I will gently drop my wontons. For this step (and many of the following), the above pictured cooking implement is key. I don't know what it's called, I just know that it's essential in this style of cooking, and also for steamboats (mmm, steamboats). 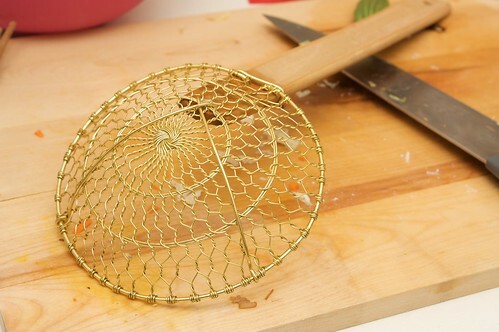 Anyway, using this golden wire scoop, gently lower four or five wontons into the boiling stock. Let them boil away for six or seven minutes, or until they're floating on the top (mine always float from the very start, which is why I have to time them). Put these aside. Back to the pot, I'll add my vegies (in this instance, one carrot that has been julienned, and two or three bunches of bok choy that hav been sliced in half lengthways). After a minute or two, I will pull those vegies out, and put them in bowls, and put in some noodles, giving the same treatment. Serve them up in large bowls. If the wontons have cooled too much or are sticking together, I will sometimes drop them back in the pot for thirty seconds to heat them through. Then pour soup over the whole lot, and serve hot, perhaps with some chopped chilli in soy sauce. We took advantage of today's unfortunate holiday to venture over to Lisa's place for a late brunch. Please don't get me wrong, I am Australian and I like being Australian, but no way am I going to *celebrate* the invasion and subsequent decimation of a people. It's disrespectful, and it erases our history, which for good or bad is still our history. Also, as vegans, we are already incredibly unAustralian, just ask the Lamb industry and Sam Kekovich. So we took advantage of the day instead, and had an 'unAustralian' brunch (ie, no animals were injured in the makings of our brunch). We had a small but very convincing array of sweet goods. Cate's cinnamon scrolls were where most of us started, and where some of us sadly thought we'd have to end - covered in molten sugar and filled with the same, this sent me into a sugar coma. However do not fear, I was not defeated by this deliciousness! I soldiered on. 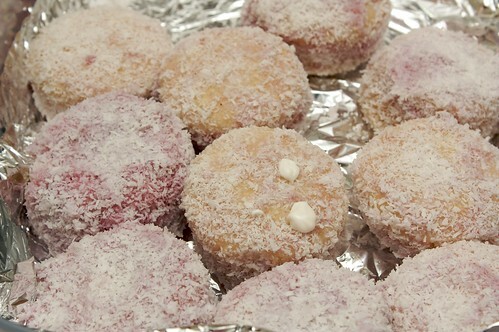 Kristy provided lamingtons, I believe because Toby has never before eaten their coconutty deliciousness. These lamingtons were supposed to have soyatoo whipped cream in them, but there was some sort of cream dispensing failure. They were still delicious! ETA these were in fact jelly cakes! Which I ALSO have never before had! INTERESTING. 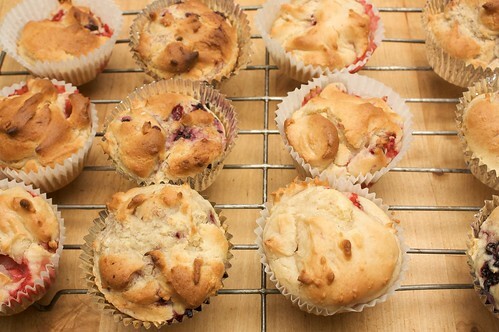 I woke up early to my alarm this morning, in order to bake some gluten-free berry cupcakes - six strawberry, and six blackberry, freshly purchased from the Queen Vic Markets. I did this by splitting the plain batter, and then carefully mixing into each half. This was the first time I have split a batter for this purpose, and it was lots of fun! The savouries were also worth getting up for! Craig and Bec, after cycling all the way from Richmond, appeared with these freshly made dips: one carrot, and one capsicum, to go with Bec's freshly baked bread. It was still warm! And it was very delicious (and gluten-y. and crisp. and amazing). Craig also provided aoli and tempeh chips. 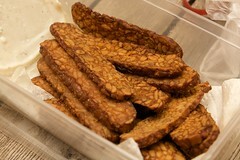 These tempeh chips were super delicious and (allegedly) super simple, I am definitely going to give them a go! We were super lucky to end up with two potato products. I say super lucky because I LOVE potato products, so I was very interested in eating these all up. Kristy and Toby brought these potato and pea hashy things (I don't know if they had an official name). They were awesome! 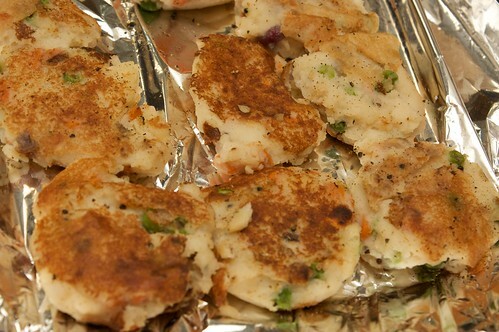 ETA Kristy informs me these were in fact samosa pancakes. Fantastic! Chris concocted this baked hash thing (officially, a baked hash thing), topped with nutritional yeast/savoury yeast flakes. It was very squishy but very tasty! At first I was really conflicted by the 'unAustralian' theme of our brunch. I mean, such a term is immediately fraught with problems and opportunities for parochial crap, and, you know, the positioning of anything that isn't meat pies or anything that is 'foreign' as being, well, foreign. 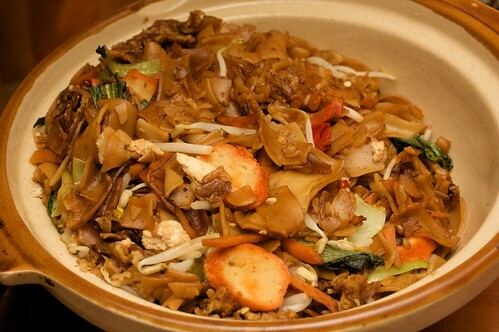 But such complications didn't prevent me from making only my favourite breakfast food ever, char kuay teow. It is the best. I eat it as often as I can for breakfast. To round things out (or more accurately, to begin it), Lisa provided us with miso soup and some okonomiyaki. 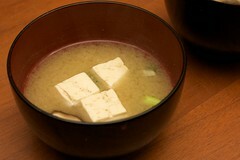 I haven't had miso soup in an age, and it was a delicious and refreshing way to start our brunch. It was great! 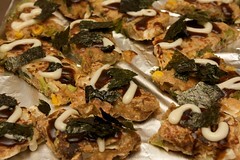 The okonomiyaki was also pretty tasty, and as Lisa said, clearly nom because it has nom in the name! full set of nom photos here. I will update this post with recipes as they appear on the internets. Cate has a post up about brunch. Here are some recent things I've cooked that haven't quite been as delicious as I might have hoped. 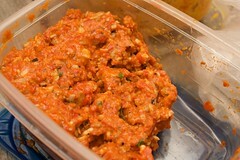 SJ has this really awesome tempeh bolognaise recipe, which I have made several times as the sauce for plain pasta. 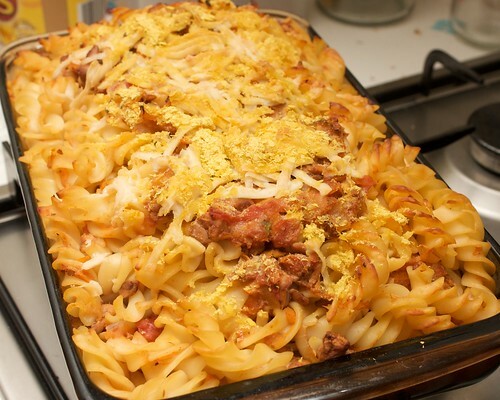 We thought we'd see how this went as a pasta bake, since it allegedly goes amazingly as a lasagna sauce. 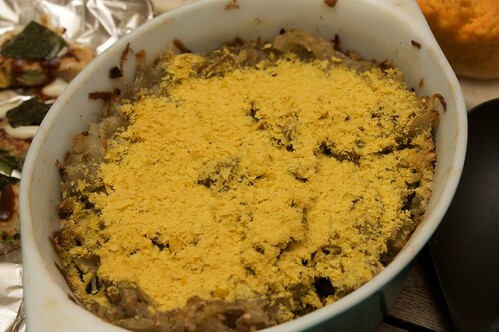 I topped this with grated cheezly and some nutritional yeast/savoury yeast flakes, and it didn't go that well. The sauce was either too thin to hold to the pasta, or too thick with tempeh to hold to the pasta. The very top of it, encrusted with cheezly and nutritional yeast, was quite tasty though. 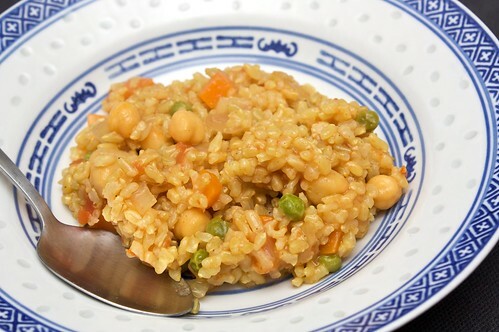 The texture of this dish was perfect, and given it was brown rice I was quite pleased. However biriyani it was not. I followed this recipe ish, approximately anyway, and doubled the spices and added extra (garamasala, for example, featured heavily), and it was still kind of bland. Could have done with more spice. I might try this one again. 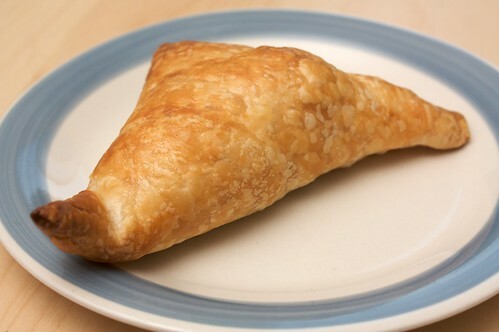 Lastly a curried vegetable pasty. Not sure where I got the recipe for this one, but again it was a bit bland, could have done with some more spices. Puff pastry covers many sins, but not all of them. We had a bit of a drama-rama Wednesday night, and Danni woke up feeling moderately under the weather, and had a bit of a sick day. In my family, the answer to 'feeling cold and flu-ey' is always curry, so I suggested we have a bit of a Malaysian day. 'When don't we?' Danni asked, and I suppose this is true, so we followed our delicious Malaysian treats with some delicious Malaysian curry. I haven't made rendang in ages, and was hoping to try something new, so I modified this recipe at the star online (which to my shame, ahaha, is often my first stop when looking for Malaysian recipes). Rendang renders all the way down, so don't expect too much liquid from this dish. Pound together the paste ingredients until a chunky paste is formed. You can make it a smooth paste, but I like it to still have some bits in it. Squish out the water in the tofu. 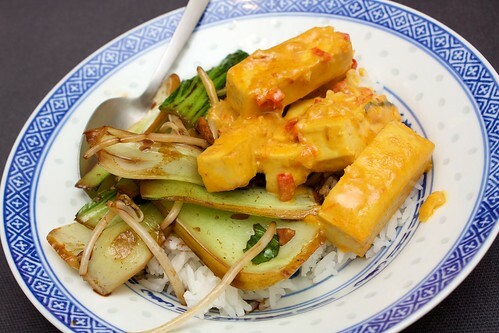 In a thin-bottomed pot over medium heat, add a little peanut oil with the lemon grass and the tofu. 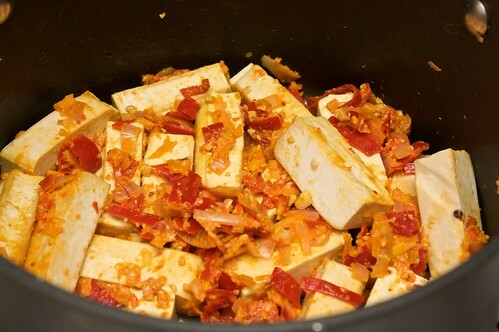 Fry the tofu for about five minutes, until it starts to colour, then add the paste. 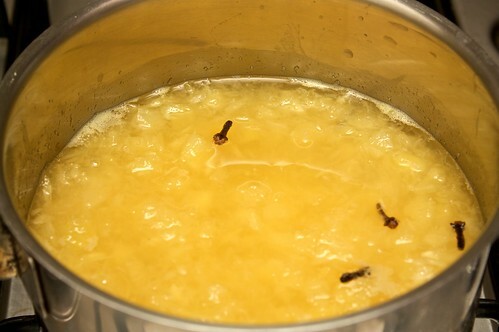 Keep frying for another three or four minutes, stirring constantly so that it doesn't stick too much. Add a tiny bit more oil if necessary. Add the coconut milk, and bring to a boil, then reduce to medium-low heat and simmer for about twenty five minutes, lid off. Stir occasionally, and about halfway through add the stock. Add the shredded lime kaffir leaves and the lime juice, and simmer for another five minutes, or until the entire mixture has well reduced. I served this with some bok choy and bean shoots in a little garlic-soy sauce. Please see pineapple tarts part one: the jamening for previous adventures in pineapple tarts. Last week's batch of pineapple tarts resulted in too much batter and insufficient jam quantities. Buoyed by my success of first time jam, I decided to go for a double batch of jam, using one large tin of crushed pineapple instead of one small tin of diced pineapple. This was a mistake! The jam started simmering away happily, then took one million trillion years to reduce, and then started burning to the base! The end result was a very strong pineapple jam, in the wrong colour, and of copious quantities! It was perfectly serviceable for experimenting, but I would probably not serve it to anyone! The purpose of part two was to see if I could make this batch free from gluten. I would judge this as moderate success - the flavour of the pastry was a bit milder than I would ideally like it, and it didn't need as long in baking (the end result with the same baking time is a little stiff, clearly over cooked). The pastry goes stale after one day, but I was expecting that. Overall, however, I think I am foreseeing success in my gf pineapple tart future. One moderately warm afternoon a couple of weeks ago, during the Christmas and new year break, we had a friend coming over. Instead of attempting to find a place that was both open and served vegan cake, I decided to try making an apple tea cake. I love tea cake! So light and fluffy and cinnamon-y, it is always a good time to eat a tea cake, not just at afternoon tea time! 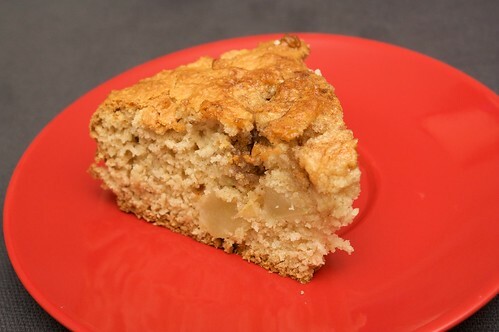 I modified the cinammon tea cake recipe I have used previously, adding two peeled and diced apples to the mix, but keeping everything else the same. Baking time increased slightly, by about eight or nine minutes. A couple of weeks ago our good friends J + DB came over for dinner! Asked if they could bring anything, I answered, as I often do, with, "dessert, if you like!" I usually make a pretty plain fruit salad, with whatever I have on hand (preferably with lots of watermelon and oranges), so it was awesome to eat a fruit salad that was all exciting flavours and things I rarely eat! The highlight of this fruit salad, for me, was the pomegranates. I'd not previously eaten one, and it was exciting to eat such a fun fruit! 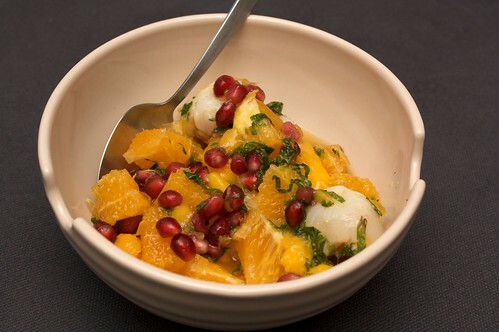 This salad also contained orange pieces, mint, lychees stuffed with crystalised ginger, and perhaps some mango. 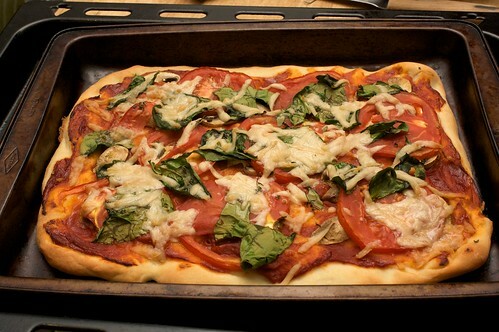 We've had a recent run of home made pizzas, and recently invited J over to share in the noms. Using our usual pizza base (but without wholemeal, as we are all out), we put together three awesome pizzas. Potato and zucchini was J's idea. I sliced and fried the potatoes, then we spread out a thin layer of tomato paste with some crushed garlic and some fresh herbs, and then went to town with the potato and zucchini. 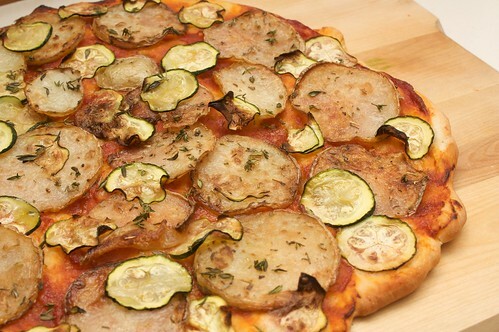 This pizza was super delicious (I love potato). I visited Radical Grocery in order to pick up some Cheezly, going for the mozzarella variety. Cheezly is always a bit on the expensive side, so we went easy, using about a third of the bar. We cut big slices (but thin) of tomato for this one, because that is my favourite way - it really helps retain the moisture and fills your mouth with delicious tomato flavour. Again, fresh herbs from the garden, and some spinach. To round it out, I caramalised some apples and pears in brown sugar, and used the Sweet William chocolate spread on the base. I also crumbled some of their white chocolate in amongst the pear and apple pieces, and when it came out of the oven I carefully sprinkled icing sugar over the top. Delicious! I love making pizza. It's lots of fun, and I know it's not going to be oozing oil (unless I want it to be), or accidentally covered in cheese. 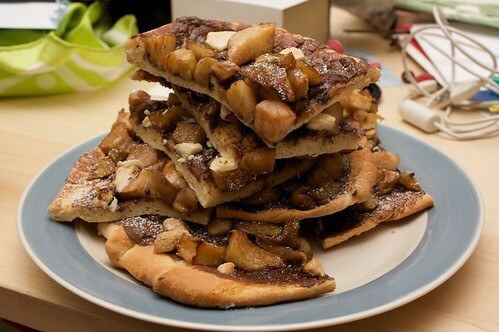 ETA Danni claims dessert pizza was originally her idea, when we were still living in Perth. So I give credit to her! There's a bit of a reputation for Chinese people to not like sweet things. The evidence for this, I suppose, is in our savoury desserts and in our lack of chocolate (...valid points). This fits, I suppose, with the Nyonya kuih, sweets that are not sweet (and are, in fact, savouries), biscuits that are not really sugary. 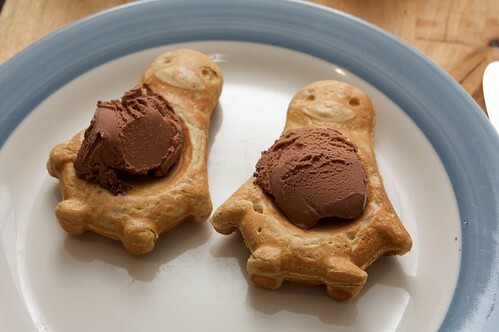 And they are delicious, my very favourite biscuits ever. More favourite than tim tams, before I went vegan! 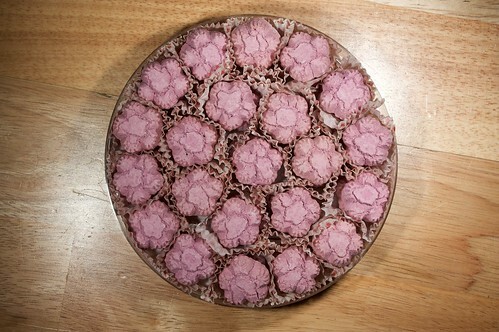 I don't know how to describe my love of kuih, but I will try, in this way: I just found this clip on the SBS website, and it is a minute and a half of wordless kuih-making, and I spent the entire time filled with longing and delight and want (TO EAT IT ALL). Often (but not always) made from glutinous rice flour, kuih range from cakes, to biscuits, to wafer thin pastries. And Chinese New Year is the jackpot, mountains of kuih, bright colours and biscuits that melt when you put them on your tongue. Kuih is often vegan, except sometimes you need to watch out for eggwash, or in some of the cakes actual eggs. This CNY my kuih goal is pineapple tarts. Pineapple tarts come in three forms: closed, rolled open, and open. The first attempt at pineapple tarts began, oddly enough, not with picking a recipe (though that was part of it), but picking a style. I baked all three, and have picked closed. Styled with patience and accuracy, they look like tiny pineapples, and the way the pastry crumbles through your whole mouth is awesome. However before baking, I first made pineapple jam! You may remember my recent requests that people make jam and then give it to me, because I am not a jam maker. I spent some time searching the shops nearby for pineapple jam, and though I found quince, rosehip, fig, apricot, raspberry, tropical, strawberry and ginger marmalade jams, I was quite unable to locate pineapple jam. So I bought a can of pineapple instead, and made pineapple jam! It was great! 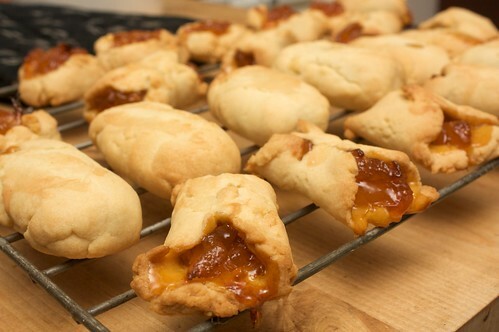 Super easy, and it made for jam of perfect consistency to put inside the dough. And so it was, two firsts in one day, labouriously playing with pineapples. The thing is, I don't even like pineapples - but I love pineapple kuih! The recipe is not quite finalised, so more to come - I have high hopes that I can make this gluten free (pineapple tarts are one of the few kuih that are not made with rice flour). And expect more CNY posts as we get closer, and I try out more things. Recently Miss T has been on a quest to end same same cookering, and this resulted in some cookering from the Asian Vegan Kitchen. As this is a book I have and haven't used it a while, I thought I would give it a go! I was feeling in a curry mood (nb: this is actually my normal state), so I picked something with liquid, the assorted vegetables in cashew gravy (India, p18), and something with lots of spicy, the fiery potato curry (Malaysia, p160). In contrast to Miss T, however, this did not prove an end to same-same cookery. The fiery potato curry had that strong, slightly assam, overwhelming flavour I associate with my childhood. 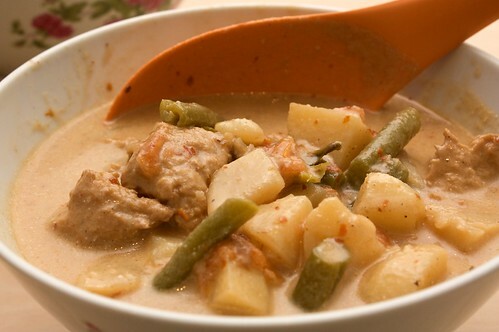 It was not until I was pounding the spices together that I realised that the smell was so familiar, a smell I used to hate when I was a kid, and I flipped back to the book and I looked at the Malay translation: kari pedas kentang. Oh, of course. Don't get me wrong, this curry was delicious. It would have been more delicious if I had cooked the onion for longer, but it was rich and full-flavoured, and delightfully spicy (and, incidentally, nowhere near as spicy as I had thought it would be). It's not something I've cooked before, but it's not something unfamiliar, so I was a bit annoyed at myself! It was still good, and I will probably cook this one again. 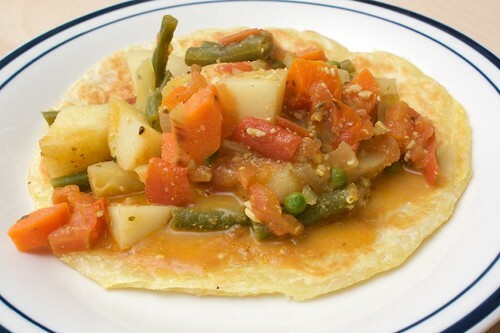 The assorted vegetables in cashew gravy was nice, but a bit bland. The recipe calls for presteaming the root vegetables - if I were to cook this again I would instead go for a longer cooking time and try to cook the vegetables in the sauce. I would probably also add a little bit more chili, and maybe a bit more coriander. It did make a nice contrast to the fieryness of the potatoes. I modified the potato curry to make it gluten free; the cashew gravy was already gluten free. Then of course we ruined it by serving on roti, but that's because roti is the best. 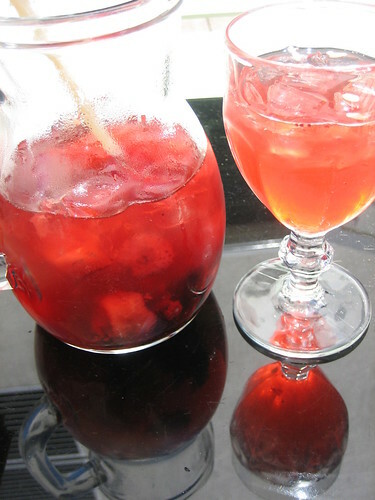 I spent several hours on Thursday lounging around Madame Brussels with my friend Dee, eyeing off the wading pool and drinking several jugs. 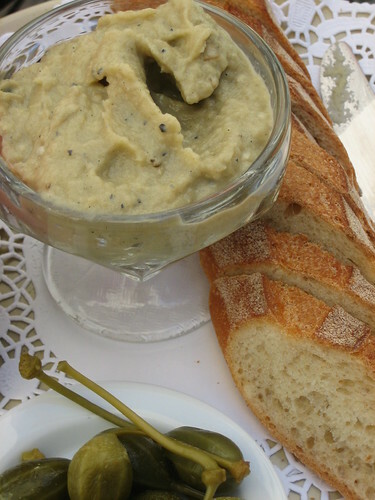 Having missed lunch due to a poorly thought out hair appointment, we thoughtfully ordered the dip of the day, which was baba ganoush. It was super delicious. I'm not actually sure what we drank, there was definitely a jug of pimms, and then something that could have involved sous gin. Or sous rum. Is that a thing that exists? I suppose, for accuracy, I'll just have to return and order it again. It was a nice afternoon to sit in the courtyard at Madame Brussels, and although the menu is a long series of things not suitable for vegans, at least the dips are nice (the beetroot is possibly not vegan) and the drinks are super delicious. One of the difficult things about moving across the country is finding substitutes or replacements for all the things you used to buy. Currently I am trying to find a good mock chicken pieces product. I used to use the same stuff that Lord of the Fries uses for their nuggets, it was amazing. Anyway, now here we are in Melbourne and I am looking but not quite there. The most important thing my fake chicken pieces have to be able to do is perform adequately in a kapitan recipe. 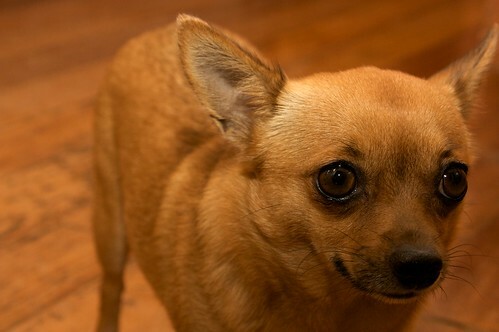 I picked up something called 'veaty bites' from the grocer at Barkly Square. The chicken pieces had the right sort of texture, and are gluten free, so meaning I can still make this recipe gluten free, hooray! But the pieces were not quite right, and the packaging was extensive, so whilst these were an okay substitute, I continue my search. The only pub I've been to since we moved to Melbourne is the EBC. This seems a bit ridiculous, I know. I did go to the Workers once for a craft fair, I picked up the greatest necklace ever for Danni, and some awesome vintage scarfs. So I got to try out the Glenferrie Hotel for the Christmas party. There was one thing on the menu I could eat without modification, and since I was in a pasta mood I decided to go for it. Just a plain pasta with mushrooms, but the addition of caramelised red onion in the sauce gave it a depth that meant I scooped up all of the sauce at the end. Nothing special, but a perfectly serviceable meal (and alcohol paid for by the company). I recently made a batch of gluten-free cupcakes for Kristy. This was Danni's great idea, but masterfully executed by me in a very warm kitchen on a very warm day. GF cupcakes aren't difficult, most non-GF recipes can be altered to be gluten-free, but I paid attention to the alterations that I made because it's not quite comparable. When I'm GF baking, it tends to take me a little bit longer because I pause to check that every item I'm using is GF. This is because lots of things have hidden wheat, such as some baking cocoas and baking powders. This photo is a cheat! I am using it to illustrate this post because I failed to take photos of the actual cupcakes I baked yesterday. Sorry! I swear they looked just like this! Only the tea towel was blue, not yellow. And I baked them in little foil cup cake cups so that I could put them all in a little basket. For reference, this link is my usual recipe. Some of the changes are immediately noticeable. I use more liquid because the Orgrans GF flour is a lot drier than gluteny flour, and will crumble if there isn't more liquid. I use slightly more flour, because I have a lot of trouble getting GF flour to rise. And I don't use baking powder! SJ, who is my GF baking guru, told me long ago that some combined baking powders use wheat to bulk it up, so to ensure there's no risk, I tend to use a combination of cream of tartar and bicarb soda. Sift together flour, sugar, cocoa, bicarb and cream of tartar. Mix in vanilla essence, nuttelex and apple sauce. Slowly mix in milk, until the batter is thick. Add a little more milk if the batter seems too thick - it needs to be very smooth and of a nice liquid consistency, but don't worry if there are the occasional lumps. GF flour is quite clumpy. Mix in the jam and the chocolate bits. 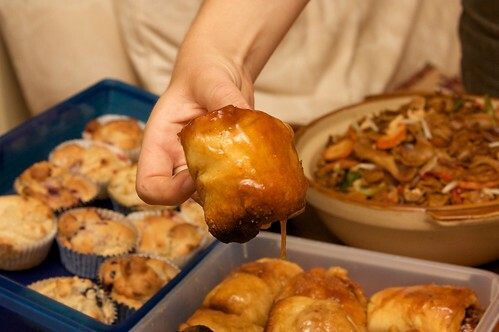 Grease cupcake pan, and divide equally in to twelve cupcake moulds. 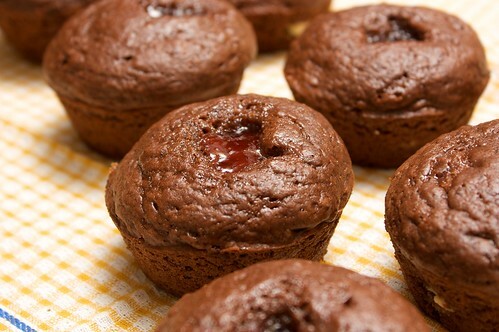 Drop half a teaspoon of jam on to the top of each cupcake. Bake 180C for 35ish minutes, or until a skewer comes out clean. So one of the reasons why I started this blog was to explore vegan food through my lens as Chinese Australian, and reconcile OMG NO MEAT with a lot of the things I used to take for granted. I have posted a little about it directly, but mostly I just try to find a lot of food that meets my requirements as Chinese and vegan and delicious. In my Real Life as an occasional anti-racism blogger, I'm hosting the 5th Asian Women Blog Carnival. Posts are welcome from both Asian women and allies. The theme is Who I Am When I'm (not) With You. The full explanation post can be found here, and it contains all the details regarding submissions and guidelines. I know that there are some people lurking in this blog that would be interested in that, so please, you know, check it out, or consider posting something for the carnival! Submissions are due a few days before CNY. I try to be timely with my restaurant reviews, within the week, but sometimes experiences get lost in the rush and you end up blogging about them six months later. When we first got to Melbourne we were staying with some friends, and one morning went out investigating apartments and nomming delicious foods. We ended up at Little Byrd, where there was only one thing on the menu for vegans, but that one thing was delicious. 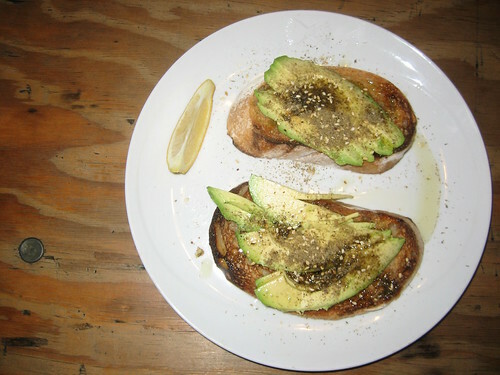 Avocado with zaatar on sour dough, om nom, om nom. Not too expensive, well worth the visit. After five years of campaigning against ‘unAustralian’ behaviour across the nation and urging us to unite over a lamb chop on Australia Day, Sam Kekovich is set to take his cause global.Convinced that mankind is facing a pandemic that threatens its very existence - unAustralianism - Sam will ask the United Nations to declare 26 January ‘International Australia Day’ in his 2010 Address. OH GOOD because nothing makes me feel better about being a Chinese-Australian vegan than being told I have to kill lambs in order to count as an actual Australian. Why vegans were right all along at the Guardian. I regularly read vegan.com because Erik Marcus is always talking about and linking to interesting stuff, and he has written The Year in Meat 2009, a really interesting read on animal agribusiness and vegarianism (mostly US-centric) in 2009. So, yesterday, as I mentioned in my last post, I had plans to use the leftover cheesy sauce from recent breakfast as part of a pasta dish. I did this, and it was amazing. It was so delicious! I really looked forward to lunch today, when I ate the left overs! We made this up to use up some leftover cheese sauce, but I am happy to make the sauce specifically to put on this dish - it's exactly what my pasta bakes needed. Cook the pasta in the usual way. In a tiny bit of oil, fry the marjoram, oregano and chilli flakes for a minute or two, along with the garlic. Add in the cubed tomato, bring to a boil, then reduce and simmer with the lid on. Stir occasionally. After half an hour, the tomato should have reduced significantly. 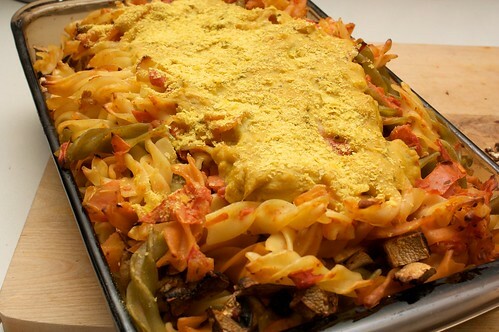 Stir in two heaped tablespoons of nutritional yeast, and simmer with the lid off for another fifteen minutes. In an appropriately sized dish, combine the pasta spirals, the mushrooms and the tomato sauce. Pour the cheese sauce over the top (if you have prepared this earlier, heat it first, to make it easier to pour). Finally, shake some more nutritional yeast. Bake for about fifteen minutes at 180C. Serve, making sure to mix the cheese sauce through. This made about five portions. Well, internets, I am back at work today. This meant an early start to my day, a few pieces of toast and out the door. But whilst I was still off work, we tried for some big breakfasts, and I trawled through Vegan Brunch for some tasty looking things. Earlier in the week we tried the gingerbread waffles, which made enough batter for two days worth of breakfasts (four penguins for each of us each day, sixteen penguins in total). 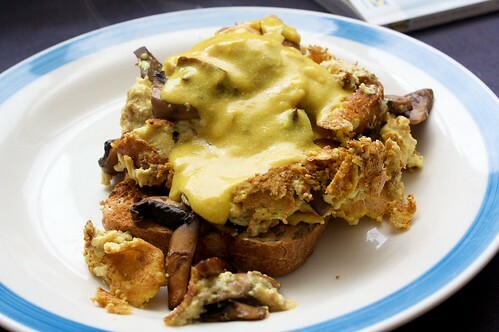 A few days later, Danni was watering our plants and noted the huge amount of basil growing cheerfully away, so I took the opportunity to try the scrambled tofu with pesto. This didn't seem to be so much scramble as cubes. I really liked this dish - frying the tofu for so long as the tomatoes smushed down (my favourite way of eating them) added this really great flavour, and I loved the addition of pesto. Will definitely do this one again - maybe with smaller cubes. The next day we tried the omlettes, which Cindy had blogged about as delicious. Don't get me wrong, these were great (and delicious), but I had two problems. They took an incredibly long time to cook - D had already finished her omlette well before I was ready to eat mine; and my pan is old, so it was less flipping and more failing and looking a bit scrambled. Not so much a problem but more an inconvenience, it was a Sunday morning and I couldn't be bothered traipsing around to find black salt, so I went without. Still, these were really delicious and, though they require many dishes, I will probably try this one again as well. 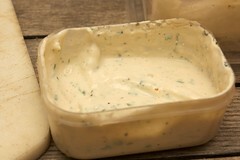 We have a lot of left over cheeseish sauce, I'm thinking of using it in a pasta bake this evening. Mmm pasta bake. This is a big claim, the most delicious pasta ever! Not my claim mind you, but Danni's. This is also her recipe, made up a few weeks ago after yet another (for me) very late end to the working day. 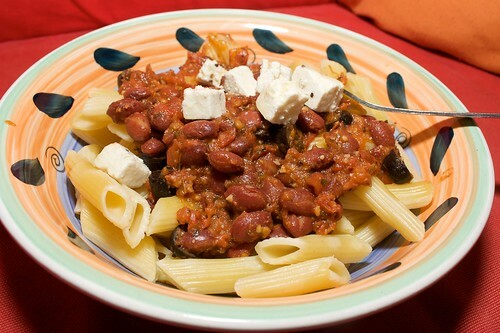 It features kidney beans, olives and tofetta in a tomato sauce. This renders down quite a lot, and makes two or three portions. In a little bit of olive oil and nuttelex, fry the dried basil, oregano and marjoram for a minute or two. Don't burn! Add the tomatoes, stir a little, then reduce heat and simmer with the lid on for about thirty minutes. The tomatoes should have rendered down quite excellently. Add the kidney beans (drained), and the olives, and return to simmering for another fifteen or so minutes. 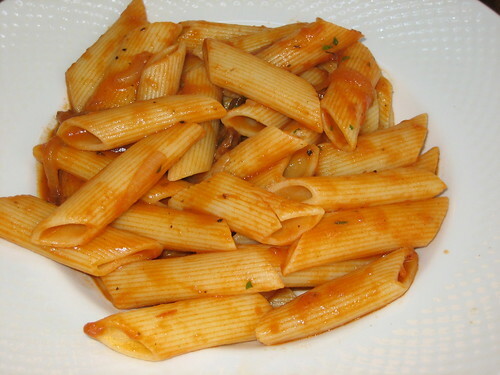 Stir through the small cubes of tofetta, allowing it to melt just slightly, then serve atop pasta. Danni got me Vegan Brunch for Christmas this year. I was pretty excited! So far we've only made the one thing (gingerbread waffles). These were tasty but the fresh grated ginger overwhelmed everything else, so it was less gingerbread waffles and more ginger waffles. The chocolate icecream didn't really go with this. This book seems to be set out a lot better than Veganomicon, which I appreciate. The stock photos are a bit weird, almost like the spaces were set for photos and then no one got around to taking them. But overall everything seems cool. Lots of other interesting looking things to try. 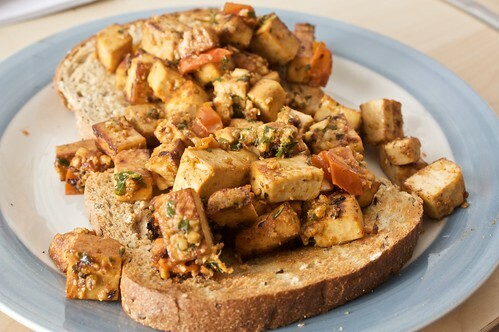 I'm looking forward to doing something tofu-related for breakfast tomorrow. Or perhaps something potato related. Something delicious, anyway.